"Arquebusier" redirects here. For the type of cavalry, see Harquebusier. The arquebus (/ˈɑːrk(w)ɪbəs/ AR-k(w)ib-əs), derived from the German Hakenbüchse, was a form of long gun that appeared in Europe during the 15th century. Although the term arquebus was applied to many different forms of firearms from the 15th to 17th centuries, it originally referred to "a hand-gun with a hook-like projection or lug on its under surface, useful for steadying it against battlements or other objects when firing." These "hook guns" were in their earliest forms defensive weapons mounted on German city walls in the early 1400s, but by the late 1400s had become handheld firearms. The development of the arquebus is somewhat tied to technology developed for the crossbow as without the stock from the crossbow, the arquebus would not have a stable platform to rest one's shoulder on. Priming pans also were placed on the arquebus. A matchlock mechanism was added around 1475 and it became the first firearm with a trigger. The heavy arquebus, known as the musket, was developed to better penetrate plate armor and appeared in Europe around 1521. A standardized arquebus, the caliver, was introduced in the latter half of the 16th century. The name "caliver" is derived from the English corruption of calibre, which is a reference to the gun's standardized bore. The caliver allowed troops to load bullets faster since they fit their guns more easily, whereas before soldiers often had to modify their bullets into suitable fits, or were even forced to make their own prior to battle. The smoothbore matchlock arquebus is considered the forerunner to the rifle and other long gun firearms. Heavy arquebuses mounted on wagons were called arquebus à croc. These carried a lead ball of about 3.5 ounces (100 g). 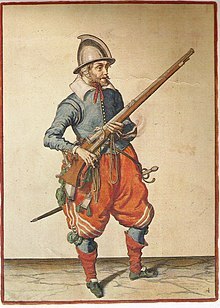 An infantryman armed with an arquebus is called an arquebusier. The arquebus has at times been known as the harquebus, harkbus, hackbut, hagbut, archibugio, haakbus, schiopo, sclopus, tüfenk, tofak, matchlock, and firelock. In the early 16th century, the term "arquebus" was used to describe an assortment of guns, but by the late 16th century the arquebus, caliver, and musket had settled down into size categories for firearms. Continental European powers such as the Iberians, Germans, and French differentiated muskets from arquebuses by size and if they required a fork rest or not. However, the musket – essentially a large arquebus – which had been introduced around 1521, fell out of favor in the mid 16th century due to the decline of armor, but the term stuck around and musket became a generic descriptor for all 'shoulder arms' fireweapons into the 1800s. At least on one occasion the musket and arquebus have been used interchangeably to refer to the same weapon, and even referred to as an "arquebus musket". A Habsburg commander in the mid-1560s once referred to muskets as "double arquebuses". The matchlock firing mechanism also became a common term for the arquebus after it was added to the firearm. Later flintlock firearms were sometimes called fusils or fuzees. Prior to the appearance of the serpentine lever by around 1411, handguns were fired from the chest, tucked under one arm, while the other arm maneuvered a hot pricker to the touch hole to ignite the gunpowder. The matchlock which appeared roughly around 1475 changed this by adding a firing mechanism consisting of two parts, the match, and the lock. The lock mechanism held within a clamp a two to three feet long length of smoldering rope soaked in saltpeter, which was the match. Connected to the lock lever was a trigger, which lowered the match into a priming pan when squeezed, igniting the priming powder, causing a flash to travel through the touch hole, also igniting the gunpowder within the barrel, and propelling the bullet out the muzzle. The trigger mechanism of the early arquebus most often resembled that of a crossbow: a gently curved lever pointing backward and parallel to the stock (see photo of the trigger mechanism above). By the later 16th century, gunsmiths in most countries had begun to introduce the short trigger perpendicular to the stock that is familiar to modern shooters. However, the majority of French matchlock arquebuses retained the crossbow-style trigger throughout the 17th century. While matchlocks provided a crucial advantage by allowing the user to aim the firearm using both hands, it was also awkward to utilize. To avoid accidentally igniting the gunpowder the match had to be detached while loading the gun. In some instances the match would also go out, so both ends of the match were kept lit. This proved cumbersome to maneuver as both hands were required to hold the match during removal, one end in each hand. 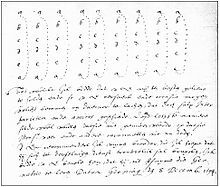 The procedure was so complex that a 1607 drill manual published by Jacob de Gheyn in the Netherlands listed 28 steps just to fire and load the gun. In 1584 the Ming general Qi Jiguang composed an 11 step song to practice the procedure in rhythm: "One, clean the gun. Two, pour the powder. Three, tamp the powder down. Four, drop the pellet. Five, drive the pellet down. Six, put in paper (stopper). Seven, drive the paper down. Eight, open the flashpan cover. Nine, pour in the flash powder. Ten, close the flashpan, and clamp the fuse. Eleven, listen for the signal, then open the flashpan cover. Aiming at the enemy, raise your gun and fire." Reloading a gun during the 16th century took anywhere from 20 seconds to a minute under the most ideal conditions. 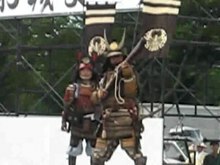 All the musketeers, when they get near the enemy are not allowed to fire early, and they're not allowed to just fire everything off in one go, [because] whenever the enemy then approaches close, there won't be enough time to load the guns (銃裝不及), and frequently this mismanagement costs the lives of many people. 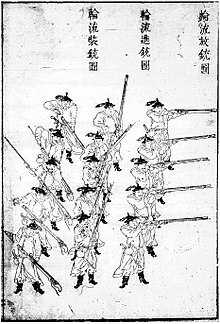 Thus, whenever the enemy gets to within a hundred paces' distance, they [the musketeers] are to wait until they hear a blast on the bamboo flute, at which they deploy themselves in front of the troops, with each platoon (哨) putting in front one team (隊). They [the musketeer team members] wait until they hear their own leader fire a shot, and only then are they allowed to give fire. Each time the trumpet gives a blast, they fire one time, spread out in battle array according to the drilling patterns. If the trumpet keeps blasting without stopping, then they are allowed to fire all together until their fire is exhausted, and it's not necessary [in this case] to divide into layers. I have discovered evolutionibus [a term that would eventually be translated as "drill"] a method of getting the musketeers and others with guns not only to practice firing but to keep on doing so in a very effective battle order (that is to say, they do not fire at will or from behind a barrier ...). Just as soon as the first rank has fired, then by the drill [they have learned] they will march to the back. The second rank either marching forward or standing still, will then fire just like the first. After that the third and following ranks will do the same. When the last rank has fired, the first will have reloaded, as the following diagram shows. Once volley firing had been developed, the rate of fire and efficiency was greatly increased and the arquebus went from being a support weapon to the primary focus of most early modern armies. The wheellock mechanism was utilized as an alternative to the matchlock as early as 1505, but was more expensive to produce and limited primarily to specialist firearms and pistols. The snaphance flintlock was invented by the mid 16th century and then the "true" flintlock in the early 17th century, but by this time the generic term for firearms had shifted to "musket", and flintlocks are not usually associated with arquebuses. The main propellant is ignited, and much smoke ensues. The earliest form of arquebus appeared in Europe by 1411 as a hand cannon with a serpentine lever to hold matches. Around 1470 a shoulder stock was added to the arquebus and in 1475 the matchlock mechanism was added, making the arquebus the first firearm to use a trigger. It is also considered to be the first portable shoulder arms firearm. The arquebus was used in substantial numbers for the first time in Europe during the reign of king Matthias Corvinus of Hungary (r. 1458–1490). One in four soldiers in the Black Army of Hungary wielded an arquebus, and one in five when accounting for the whole army, which was a relatively high proportion at the time. Although they were present on the battlefield King Mathias preferred enlisting shielded men instead due to the arquebus's low rate of fire. While the Black Army adopted arquebuses relatively early, the trend did not catch on for decades in Europe and by the turn of the 16th century only around 10% of Western European soldiers used firearms. Arquebuses were used as early as 1472 by the Spanish and Portuguese at Zamora. Likewise, the Castilians used arquebuses as well in 1476. It is important to note that the English were rather fast at adopting the Arquebus by equipping some of their Yeomen of the Guard with the firearms shortly after 1476, while it took the French until 1520 to finally start adopting it. However, arquebus designs continued to develop and in 1496 Philip Monch of the Palatinate composed an illustrated Buch der Strynt un(d) Buchsse(n) on guns and "harquebuses". Arquebus designs spread rapidly from Europe and by 1500 had reached India. The effectiveness of the arquebus was apparent by the Battle of Cerignola of 1503, which is the earliest recorded military conflict where arquebuses played a decisive role in the outcome of battle. In Russia a small arquebus called pishchal (Russian: пищаль) appeared in the early 1500s. The Russian arquebusiers, or pishchal'niki, were seen as integral parts of the army and one thousand pishchal'niki participated in the final annexation of Pskov in 1510 as well as the conquest of Smolensk in 1512. The Russian need to acquire gunpowder weaponry bears some resemblance to the situation the Iranians were in. Just like in Iran where a lack of firearms led to a defeat in 1473, Russia's lack of firearms is blamed for the loss at Muscovite in 1501. After this defeat the Russians began increasing their use of firearms including the use of the pishchal'niki. In 1545 two thousand pishchal'niki (one thousand on horseback) were levied by the towns and outfitted at treasury expense. Their use of mounted troops was also unique to the time period. The pishchal'niki eventually became skilled hereditary tradesmen farmers rather than conscripts. Arquebuses were used in the Italian Wars in the first half of the 16th century. Frederick Lewis Taylor claims that a kneeling volley fire may have been employed by Prospero Colonna's arquebusiers as early as the Battle of Bicocca (1522). However this has been called into question by Tonio Andrade who believes this is an over interpretation as well as mis-citation of a passage by Charles Oman suggesting that the Spanish arquebusiers kneeled to reload, when in fact Oman never made such a claim. Arquebuses were introduced to Japan in 1543 by Portuguese traders who landed by accident on Tanegashima, an island south of Kyūshū in the region controlled by the Shimazu clan. By 1550, arquebuses known as tanegashima, teppō or hinawaju were being produced in large numbers in Japan. The tanegashima seem to have utilized snap matchlocks based on firearms from Goa, India, which was captured by the Portuguese in 1510. Within ten years of its introduction upwards of three hundred thousand tanegashima were reported to have been manufactured. The tanegashima eventually became one of the most important weapons in Japan. Oda Nobunaga revolutionized musket tactics in Japan by splitting loaders and shooters and assigning three guns to a shooter at the Battle of Nagashino in 1575, during which volley fire may have been implemented. However the volley fire technique of 1575 has been called into dispute in recent years by J.S.A. Elisonas and J. P. Lamers in their translation of The Chronicle of Oda Nobunaga by Ota Gyuichi. In Lamers' Japonius he says that "whether or not Nobunaga actually operated with three rotating ranks cannot be determined on the basis of reliable evidence." They claim that the version of events describing volley fire was written several years after the battle, and an earlier account says to the contrary that guns were fired en masse. Even so, both Korean and Chinese sources note that Japanese gunners were making use of volley fire during the Japanese invasions of Korea from 1592–1598. Tanegashima were widely used during Hideyoshi's unification of Japan and later the Japanese invasions of Korea in 1592. The Mamluks in particular were conservatively against the incorporation of gunpowder weapons. When faced with cannons and arquebuses wielded by the Ottomans they criticized them thus, "God curse the man who invented them, and God curse the man who fires on Muslims with them." Insults were also levied against the Ottomans for having "brought with you this contrivance artfully devised by the Christians of Europe when they were incapable of meeting the Muslim armies on the battlefield". Similarly, musketeers and musket-wielding infantrymen were despised in society by the feudal knights, even until the time of Cervantes (1547–1616 AD). Eventually the Mamluks under Qaitbay were ordered in 1489 to train in the use of al-bunduq al-rasas (arquebuses). However, in 1514 an Ottoman army of 12,000 soldiers wielding arquebuses devastated a much larger Mamluk army. The arquebus had become a common infantry weapon by the 16th century due to its relative cheapness – a helmet, breastplate and pike cost about three and a quarter ducats while an arquebus only a little over one ducat. Another advantage of arquebuses over other equipment and weapons was its short training period. While a bow potentially took years to master, an effective arquebusier could be trained in just two weeks. According to a 1571 report by Vincentio d'Alessandri, Persian arms including arquebuses "were superior and better tempered than those of any other nation", suggesting that such firearms were in common use among middle eastern powers by at least the mid-16th century. The Ottomans also made use of arquebuses. Arquebusiers served in the hundreds in Sultan Murad II's campaign in the 1440s when he crossed Bosporus straits and arquebuses were used in combat by the Ottomans at the second battle of Kosovo in 1448. Ottomans also made some use of Wagon Fortresses which they copied from the Hussite, which often involved the placing of arquebusiers in the protective wagons and using them against the enemy. Arquebusiers were also used effectively at the battle of Bashkent in 1473 when they were used in conjunction with artillery. In regard to Iranian use of the arquebus, much of the credit for their increase in use can be attributed to Shah Isma il I who, after being defeated by the firearm using Ottomans in 1514, began extensive use of arquebuses and other firearms himself with an estimated 12,000 arquebusiers in service less than 10 years after his initial defeat by the Ottomans. While the use of 12,000 arquebusiers is impressive, the firearms were not widely adopted in Iran. This is in no small part due to the reliance on light cavalry by the Iranians. Riding a horse and operating an arquebus are incredibly difficult which helped lead to both limited use and heavy stagnation in the technology associated with firearms. These limitations aside, the Iranians still made use of firearms and Europe was very important in facilitating that as Europeans supplied Iran with firearms and sent experts to help them produce some of the firearms themselves. Iran also made use of elephant mounted arquebusiers which would give them a clear view of their targets and better mobility. The arquebus was probably introduced to the Ming dynasty around 1549 and afterwards saw expanded use when Ming officials recognized its usefulness. There is however no exact date for its introduction and sources conflict on the manner in which it was introduced. A Chinese source claims the arquebus was introduced by a pirate, Wang Zhi, after his capture by the Ming in 1558, however this would put the introduction nearly 10 years after what other sources have stated. Another possible story involves the capture of arquebuses from Europeans by pirates led by the Xu brothers, with the firearms coming into the possession of a man named Bald Li, from whom the Ming officials later captured the arquebuses. About 10,000 muskets were ordered by the Central Military Weaponry Bureau in 1558 and the firearms were used to fight off pirates. Another source argues that the firearms first came to China during a battle in 1523 where Ming troops captured the new weapons, which remained relatively ignored until much later. It is unlike any other of the many types of fire weapons. In strength it can pierce armor. In accuracy it can strike the center of targets, even to the point of hitting the eye of a coin [i.e., shooting right through a coin], and not just for exceptional shooters. ... The arquebus [鳥銃] is such a powerful weapon and is so accurate that even bow and arrow cannot match it, and ... nothing is so strong as to be able to defend against it. Southeast Asian powers such as Đại Việt also adopted the matchlock musket. Đại Việt was considered by the Ming to have produced particularly advanced matchlocks during the 17th century, surpassing even Ottoman, Japanese, and European firearms. European observers of the Trịnh–Nguyễn War also noted the proficiency of matchlock making by the Vietnamese. The Vietnamese matchlock was said to have been able to pierce several layers of iron armour, kill two to five men in one shot, yet also fire quietly for a weapon of its caliber. In Europe Maurice of Nassau pioneered the countermarch volley fire technique. After outfitting his entire army with new, standardized arms in 1599, Maurice of Nassau made an attempt to recapture Spanish forts built on former Dutch lands. In the Battle of Nieuwpoort in 1600, he administered the new techniques and technologies for the first time. The Dutch marched onto the beach where the fort was located and fully utilized the countermarching tactic. By orienting all of his arquebusiers into a block, he was able to maintain a steady stream of fire out of a disciplined formation using volley fire tactics. The result was a lopsided victory with 4000 Spanish casualties to only 1000 dead and 700 wounded on the Dutch side. Although the battle was principally won by the decisive counterattack of the Dutch cavalry and despite the failure of the new Dutch infantry tactic in stopping the veteran Spanish tercios, the battle is considered a decisive step forward in the development early modern warfare, where firearms took on an increasingly large role in Europe in the following centuries. "Musket" eventually overtook "arquebus" as the dominant term for similar firearms starting from the 1550s. Arquebuses are most often associated with matchlocks. The arquebus had many advantages but also severe limitations on the battlefield. This led to it often being paired up with other weaponry to reduce the impact of these weaknesses. Qi Jiguang from China developed systems where soldiers with traditional weaponry stayed right behind the arquebusiers to protect them should enemy infantry get too close. Pikemen were used to protect the arquebusiers by the English and the Venetians often used archers to lay down cover fire during the long reloading process. The Ottomans often supported their arquebusiers with artillery fire or placed them in fortified wagons, a tactic they borrowed from the Hussites. 16th century military writer Sir John Smythe thought that an arquebus could not match the accuracy of a bow in the hands of a highly skilled archer; other military writers such as Humfrey Barwick and Barnabe Rich argued the opposite. An arquebus angled at 35 degrees could throw a bullet up to 1000 m or more, much farther than any archers could shoot. An arquebus shot was considered deadly at up to 400 yards while the heavier Spanish musket was considered deadly at up to 600 yards. During the Japanese Invasions of Korea, Korean officials said they were at a severe disadvantage against Japanese troops because their arquebuses "could reach beyond several hundred paces". In 1590 Smythe noted that arquebusiers and musketeers firing at such extreme distances rarely seemed to hit anything and instead decided to argue effective range, claiming that English archers like the ones from the Hundred Years' War would be more effective at 200–240 yards than arquebusiers or musketeers, but by that point there were no longer enough skilled archers in England to properly test his theories. Most high-skilled bowmen achieved a far higher rate of shot than the matchlock arquebus, which took 30–60 seconds to reload properly. The arquebus did, however, have a faster rate of fire than the most powerful crossbow, a shorter learning curve than a longbow, and was more powerful than either. The arquebus did not rely on the physical strength of the user for propulsion of the projectile, making it easier to find a suitable recruit. It also meant that, compared to an archer or crossbowman, an arquebusier lost less of his battlefield effectiveness due to fatigue, malnutrition or sickness. The arquebusier also had the added advantage of frightening enemies (and horses) with the noise. Wind could reduce the accuracy of archery, but had much less of an effect on an arquebus. During a siege it was also easier to fire an arquebus out of loopholes than it was a bow and arrow. 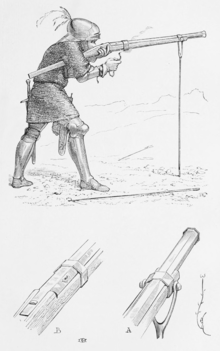 It was sometimes advocated that an arquebusier should load his weapon with multiple bullets or small shot at close ranges rather than a single ball. Small shot did not pack the same punch as a single round ball but the shot could hit and wound multiple enemies. Perhaps most important, producing an effective arquebusier required much less training than producing an effective bowman. Most archers spent their whole lives training to shoot with accuracy, but with drill and instruction, the arquebusier was able to learn his profession in months as opposed to years. This low level of skill made it a lot easier to outfit an army in a short amount of time as well as expand the small arms ranks. This idea of lower skilled, lightly armoured units was the driving force in the infantry revolution that took place in the 16th and 17th centuries and allowed early modern infantries to phase out the longbow. An arquebusier could carry more ammunition and powder than a crossbowman or longbowman could with bolts or arrows. Once the methods were developed, powder and shot were relatively easy to mass-produce, while arrow making was a genuine craft requiring highly skilled labor. The arquebus was more sensitive to humid weather. At the Battle of Villalar, rebel troops experienced a significant defeat partially due to having a high proportion of arquebusiers in a rainstorm which rendered the weapons useless. Gunpowder also ages much faster than a bolt or an arrow, particularly if improperly stored. Also, the resources needed to make gunpowder were less universally available than the resources needed to make bolts and arrows. Finding and reusing arrows or bolts was a lot easier than doing the same with arquebus bullets. This was a useful way to reduce the cost of practice, or resupply oneself if control of the battlefield after a battle was retained. A bullet must fit a barrel much more precisely than an arrow or bolt must fit a bow, so the arquebus required more standardization and made it harder to resupply by looting bodies of fallen soldiers. Gunpowder production was also far more dangerous than arrow production. An arquebus was also significantly more dangerous to its user. The arquebusier carries a lot of gunpowder on his person and has a lit match in one hand. The same goes for the soldiers next to him. Amid the confusion, stress and fumbling of a battle, arquebusiers are potentially a danger to themselves. Early arquebuses tended to have a drastic recoil. They took a long time to load making them vulnerable while reloading unless using the 'continuous fire' tactic, where one line would shoot and, while the next line shot, would reload. They also tended to overheat. During repeated firing, guns could become clogged and explode, which could be dangerous to the gunner and those around him. An arquebus also has superior penetrating power to a bow. While some plate armors were bulletproof; these armors were unique, heavy and expensive. A cuirass with a tapul was able to absorb some musket-fire due to being angled. Otherwise; most forms of armor a common soldier would wear (especially leather, light plate, and mail) had no resistance against musket-fire. Arrows however were relatively weaker in penetration, and heavier bows or crossbows required more skill and reload-time than the standard bows. Furthermore, the amount of smoke produced by black-powder weapons was considerable, making it hard to see the enemy after a few salvos, unless there was enough wind to disperse the smoke quickly. (Conversely, this cloud of smoke also served to make it difficult for any archers to target the opposing soldiers who were using firearms.) Prior to the wheellock, the need for a lit match made stealth and concealment nearly impossible, particularly at night. Even with successful concealment, the smoke emitted by a single arquebus shot would make it quite obvious where a shot came from – at least in daylight. While with a crossbow or bow a soldier could conceivably kill silently, this was of course impossible with an explosion-driven projectile weapon like the arquebus. The noise of arquebuses and the ringing in the ears that it caused could also make it hard to hear shouted commands. In the long run, the weapon could make the user permanently hard of hearing. Though bows and crossbows could shoot over obstacles by firing with high-arcing ballistic trajectories they could not do so very accurately or effectively. Sir John Smythe blamed the declining effectiveness of the longbow in part on English commanders who would place firearms at the front of their formations and bowmen at the back, where they could not see their targets and aim appropriately. Ultimately, the arquebus became the dominant projectile weapon of the early renaissance because it was easier to mass-produce and easier to train unskilled soldiers in its use. As musket technology evolved, the flaws of the musket became less frequent and the bow became irrelevant. Wikimedia Commons has media related to Arquebus. ^ Needham 1986, p. 426. ^ Chase 2003, p. 61. ^ a b KHAN, IQTIDAR ALAM (1991). "THE NATURE OF HANDGUNS IN MUGHAL INDIA: 16TH AND 17TH CENTURIES". Proceedings of the Indian History Congress. 52: 378–389. JSTOR 44142632. Chisholm, Hugh, ed. (1911). "Arquebus" . Encyclopædia Britannica. 2 (11th ed.). Cambridge University Press. This article incorporates text from a publication now in the public domain: Chambers, Ephraim, ed. (1728). "ARQUEBUSS". Cyclopædia, or an Universal Dictionary of Arts and Sciences (first ed.). James and John Knapton, et al. p. 342. ^ a b Purton 2010, p. 422. ^ "hagbut - Wiktionary". en.wiktionary.org. Retrieved 13 February 2019. ^ Purton 2010, p. 427. ^ Purton 2010, p. 117. ^ Ágoston 2008, p. 19. ^ Ágoston 2008, p. 58. ^ Lidin 2002, p. 3. ^ Smythe, John (1590). Certain Discourses. London. ^ a b Adle 2003, p. 475. ^ Andrade 2016, p. 165. ^ Chase 2003, p. 92. ^ Peterson 1965, p. 12-14. ^ a b Arnold 2001, p. 75. ^ Chase 2003, p. 24. ^ a b Chase 2003, p. 25. ^ Andrade 2016, p. 176-175. ^ Andrade 2016, p. 144. ^ a b Andrade 2016, p. 173. ^ a b Andrade 2016, p. 169. ^ a b Phillips 2016. ^ Needham 1986, p. 429. ^ Needham 1986, p. 425. ^ Petzal 2014, p. 5. ^ Partington 1999, p. xxvii. ^ Bak 1982, p. 125-40. ^ Janin 2013, p. 41. ^ Vajna-Naday, Warhistory. p. 40. ^ Courtlandt Canby: A History of Weaponry. Recontre and Edito Service, London. p. 62. ^ Stevenson, Cornelius (1909). "Wheel-Lock Guns and Pistols". Bulletin of the Pennsylvania Museum. 7 (25): 6–9. doi:10.2307/3793657. JSTOR 3793657. ^ Partington 1999, p. 160. ^ Khan 2004, p. 131. ^ Andrade 2016, p. 167. ^ a b Paul, Michael C. (2004). "The Military Revolution in Russia, 1550-1682". The Journal of Military History. 68 (1): 9–45. doi:10.1353/jmh.2003.0401. ISSN 1543-7795. ^ Taylor, Frederick. (1921). The Art of War in Italy, 1494-1529. p. 52. ^ Andrade 2016, p. 350. ^ Andrade 2016, p. 354. ^ Andrade 2016, p. 170. ^ Andrade 2016, p. 181. ^ a b c Partington 1999, p. 208. ^ Arnold 2001, p. 44. ^ Arnold 2001, p. 74. ^ a b c d Ágoston, Gábor (2014). "Firearms and Military Adaptation: The Ottomans and the European Military Revolution, 1450–1800". Journal of World History. 25 (1): 85–124. doi:10.1353/jwh.2014.0005. ISSN 1527-8050. ^ a b c d Nourbakhsh, Mohammad Reza (Farhad) (2008). "Iran's Early Encounter with Three Medieval European Inventions (875-1153 AH/1470-1740 CE)". Iranian Studies. 41 (4): 549–558. doi:10.1080/00210860802246242. JSTOR 25597489. ^ Xiaodong, Yin (2008). "WESTERN CANNONS IN CHINA IN THE 16TH—17TH CENTURIES". Icon. 14: 41–61. JSTOR 23787161. ^ a b c Phillips, Gervase (1999). "Longbow and Hackbutt: Weapons Technology and Technology Transfer in Early Modern England". Technology and Culture. 40 (3): 576–593. JSTOR 25147360. ^ Andrade, Tonio (2016). The Gunpowder Age China, Military Innovation, and the Rise of the West in World History. Princeton University Press. ISBN 9781400874446. ^ Andrade 2016, p. 172. ^ Needham 1986, p. 428. ^ Phillips, Gervase (1999). "Longbow and Hackbutt: Weapons Technology and Technology Transfer in Early Modern England". Technology and Culture. 40 (3): 576–593. JSTOR 25147360. ^ Ágoston, Gábor (2014). "Firearms and Military Adaptation: The Ottomans and the European Military Revolution, 1450–1800". Journal of World History. 25 (1): 85–124. doi:10.1353/jwh.2014.0005. ISSN 1527-8050. ^ a b Sir John Smythe (1590). Certain Discourses. ^ Peter Krenn (1995). "Material Culture and Military History: Test-Firing Early Modern Small Arms"
^ Chase 2003, p. 186. ^ Seaver, Henry Latimer (1966) . The Great Revolt in Castile: A study of the Comunero movement of 1520–1521. New York: Octagon Books. p. 325. Barwick, Humphrey (1594), Breefe Discourse Concerning the Force and Effect of all Manuall of Weapons of Fire…. Benton, Captain James G. (1862). A Course of Instruction in Ordnance and Gunnery (2 ed.). West Point, New York: Thomas Publications. ISBN 978-1-57747-079-3.